Two second-half goals from Darren Ambrose spared Crystal Palace's blushes against League Two side Torquay in the first round of the Carling Cup. After a goalless first half, summer signing Ambrose put the hosts in front on 65 minutes with a six-yard header. But Torquay equalised nine minutes later through a Tim Sills header. Ambrose sealed the victory from the penalty spot 12 minutes from time when Alassane N'Diaye was brought down by Chris Todd inside the box. 90:00+4:04 The referee brings the game to a close. 90:00+4:01 Effort from deep inside the area by Alassane N'Diaye clears the bar. 90:00+2:49 Substitution Darren Ambrose leaves the field to be replaced by Johannes Ertl. 90:00+1:16 Substitution Michael Brough comes on in place of Tyrone Thompson. 89:29 Patrick McCarthy challenges Tim Sills unfairly and gives away a free kick. Kevin Nicholson sends in a cross, Kieran Charnock takes a shot. Save by Julian Speroni. 88:58 Headed effort from deep inside the penalty area by Shaun Derry misses to the left of the goal. 86:12 Free kick taken by Clint Hill. 86:12 Booking Chris Todd receives a caution. 85:12 Chris Todd challenges Alassane N'Diaye unfairly and gives away a free kick. 83:55 Free kick taken by Kevin Nicholson. 83:55 Booking Jose Fonte is given a yellow card. 83:39 Unfair challenge on Tim Sills by Jose Fonte results in a free kick. 82:00 Headed effort from deep inside the area by Neil Danns misses to the left of the goal. 81:01 Outswinging corner taken right-footed by Darren Ambrose from the right by-line, Tyrone Thompson makes a clearance. 78:04 Substitution Sean Scannell on for Victor Moses. 78:04 Chris Robertson takes a shot from 35 yards and went wide left of the goal. 77:07 The assist for the goal came from Alassane N'Diaye. 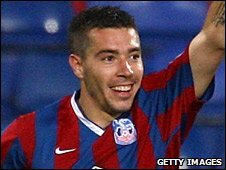 77:07 GOAL - Darren Ambrose:Crystal Palace 2 - 1 Torquay Penalty taken right-footed by Darren Ambrose and scored. Crystal Palace 2-1 Torquay. 75:24 Foul by Chris Todd on Alassane N'Diaye, Penalty awarded. 73:59 The assist for the goal came from Kevin Nicholson. 73:59 GOAL - Tim Sills:Crystal Palace 1 - 1 Torquay Tim Sills scores a brilliant headed goal from inside the area. Crystal Palace 1-1 Torquay. 71:49 Jose Fonte concedes a free kick for a foul on Elliot Benyon. Kevin Nicholson crosses the ball in from the free kick. 70:10 Substitution Mustapha Carayol is brought on as a substitute for Danny Stevens. 70:10 Substitution Elliot Benyon on for Scott Rendell. 69:31 Tim Sills takes a shot. Save made by Julian Speroni. 68:20 Kevin Nicholson takes a short corner. Shot from inside the area by Scott Rendell clears the bar. 67:38 Effort on goal by Kieran Djilali from inside the penalty area goes harmlessly over the bar. 66:53 Short corner taken by Darren Ambrose. 66:13 Unfair challenge on Chris Todd by Alassane N'Diaye results in a free kick. Chris Todd takes the free kick. 64:18 Neil Danns provided the assist for the goal. 64:18 GOAL - Darren Ambrose:Crystal Palace 1 - 0 Torquay Darren Ambrose scores a headed goal from inside the six-yard box. Crystal Palace 1-0 Torquay. 62:41 Substitution (Crystal Palace) makes a substitution, with Kieran Djilali coming on for Alan Lee. 62:41 Tyrone Thompson has an effort at goal from outside the box missing to the wide left of the goal. 60:50 Darren Ambrose produces a left-footed shot from long range which goes wide right of the goal. 57:05 Clint Hill challenges Tim Sills unfairly and gives away a free kick. Direct free kick taken by Chris Robertson. 54:49 Neil Danns has an effort at goal from close range which goes wide right of the target. 53:40 Jose Fonte challenges Scott Rendell unfairly and gives away a free kick. Free kick taken by Nicky Wroe. 53:16 Alassane N'Diaye has a headed effort at goal from deep inside the area missing to the left of the target. 50:30 The ball is swung over by Victor Moses, Alan Lee has a header from deep inside the six-yard box and clears the crossbar. 49:40 Foul by Shaun Derry on Wayne Carlisle, free kick awarded. Wayne Carlisle takes the free kick. 47:37 Scott Rendell takes a shot. Danny Butterfield gets a block in. 45:00+3:05 The whistle is blown to end the first half. Correction - 44:53 Darren Ambrose produces a cross, Neil Danns has an effort at goal from inside the six-yard box that hits the post. 44:53 Darren Ambrose crosses the ball from the free kick right-footed from left channel. 44:53 Booking Chris Robertson goes into the book for unsporting behaviour. Correction - 44:33 Unfair challenge on Alassane N'Diaye by Chris Robertson results in a free kick. 44:33 Chris Robertson challenges Alassane N'Diaye unfairly and gives away a free kick. 42:22 Victor Moses produces a volleyed left-footed shot from deep inside the area which goes wide of the left-hand post. 38:18 Effort from outside the penalty area by Clint Hill goes wide left of the target. 35:27 Patrick McCarthy challenges Tim Sills unfairly and gives away a free kick. Direct free kick taken by Chris Robertson. 34:21 Free kick awarded for a foul by Kieran Charnock on Alan Lee. Shaun Derry delivers the ball from the free kick right-footed from right channel. 33:27 The referee gives a free kick against Patrick McCarthy for handball. Nicky Wroe takes the free kick. 32:58 Effort from the edge of the box by Alan Lee goes wide of the right-hand upright. 31:57 Neil Danns takes a shot. 29:39 Chris Todd gives away a free kick for an unfair challenge on Alan Lee. Shot comes in from Darren Ambrose from the free kick. Correction - 28:25 Foul by Alassane N'Diaye on Kieran Charnock, free kick awarded. Nicky Wroe restarts play with the free kick. 28:25 Alassane N'Diaye challenges Kieran Charnock unfairly and gives away a free kick. Danny Stevens restarts play with the free kick. 27:40 Effort on goal by Alassane N'Diaye from just inside the area clears the crossbar. 27:02 Scott Rendell challenges Clint Hill unfairly and gives away a free kick. Julian Speroni takes the free kick. 23:41 Kieran Charnock gives away a free kick for an unfair challenge on Alan Lee. Darren Ambrose has a direct shot on goal from the free kick. Corner taken by Darren Ambrose from the left by-line, Scott Bevan makes a comfortable save. 22:19 Free kick awarded for an unfair challenge on Kieran Charnock by Alan Lee. Kevin Nicholson takes the direct free kick. 21:31 Darren Ambrose takes a shot. Save made by Scott Bevan. 16:45 Scott Rendell is caught offside. Indirect free kick taken by Julian Speroni. 15:51 Scott Bevan fouled by Alan Lee, the ref awards a free kick. Direct free kick taken by Scott Bevan. 15:03 Corner taken right-footed by Darren Ambrose. 14:46 Tyrone Thompson challenges Victor Moses unfairly and gives away a free kick. Shaun Derry takes the free kick. 14:06 Effort on goal by Victor Moses from just outside the penalty area goes harmlessly over the target. 10:06 Wayne Carlisle concedes a free kick for a foul on Victor Moses. Clint Hill delivers the ball from the free kick left-footed from left channel, Scott Bevan makes a comfortable save. 8:37 Unfair challenge on Chris Todd by Alan Lee results in a free kick. Scott Bevan restarts play with the free kick. 7:48 Free kick awarded for a foul by Alassane N'Diaye on Chris Todd. Kieran Charnock takes the free kick. 5:53 Outswinging corner taken right-footed by Darren Ambrose from the right by-line, Chris Robertson manages to make a clearance. 5:10 Foul by Scott Rendell on Jose Fonte, free kick awarded. Free kick taken by Julian Speroni. 4:49 Victor Moses takes a shot. Save by Scott Bevan. 2:41 Corner from the left by-line taken by Darren Ambrose, Header by Jose Fonte from deep inside the penalty area misses to the right of the target. 1:03 Corner taken right-footed by Darren Ambrose, save made by Scott Bevan.